Today we have guest post about a guest poster to this blog! YouTube celebrity The Geocaching Doc was interviewed by Mark, AKA Benign Source, AKA Banana Source of The OhBeep! 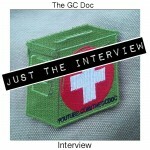 Geocaching Podcast, as heard on episode 27 of that podcast, which was released on April 27th, 2014. The interview is approximately 39 minutes long, and you can listen right here in the embedded audio player below. Be sure to listen to The OhBeep! Geocaching Podcast, a new episode of which is generally released on Sunday Evenings U.K. time, and of course you can check out the latest from The GCDoc every week right here on this blog. His entire body of work can be viewed on his YouTube Channel.